Tue, Jul 26, 2016, 08:56 pm SL Time, ColomboPage News Desk, Sri Lanka. 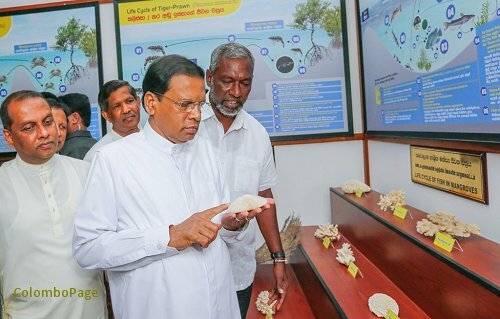 July 26, Chilaw: Marking the World Mangrove Day on Tuesday Sri Lanka's President Maithripala Sirisena opened the world's first mangrove museum which will act as a center for educating the public on the ecological value of mangroves. With a joint program launched by the President a year ago in collaboration with U.S.-based nonprofit organization Seacology and Sri Lanka-based NGO Sudeesa, Sri Lanka has become the first nation in the world to comprehensively protect all of its mangrove forests. 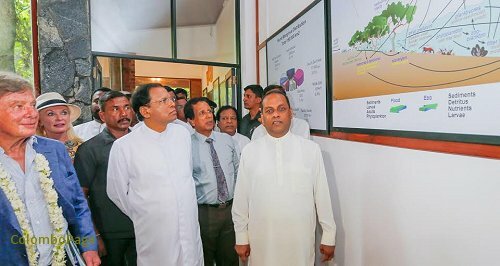 President Sirisena opened the Mangrove Museum established in Pabbala, Chilaw and launched the Sri Lanka Mangrove Conservation Program. The Museum is expected to be a central pillar of the five-year program to protect all of the island nation's mangroves. The Museum will be a center for conservation training for adults, and educating children about the value of mangroves. It is estimated that 20,000 pupils will visit the museum in the first year. The Sri Lankan government has also included mangrove forest conservation into its national curriculum. Mangroves, which are tropical trees that have thick, stilt like roots and grow in brackish swamps and shallow salt water, are vitally important since they play an important role in ameliorating climate change. Sri Lanka is the first country in the world to protect all of its mangrove forests. As these forests sequester much more carbon than other types of forests emerging as a key weapon in the fight against climate change, the program is poised to become a model for other countries. Mangrove forests also provide a key buffer, greatly decreasing damage caused by tsunamis, hurricanes, and other storms. The root system of the trees also serves as nurseries for many species of fish that go on to populate coral reefs. Launched in May 2015, the project to conserve the island's mangroves was the brainchild of the small U.S. based NGO, Seacology, which raised $3.4 million for the five-year effort. As a result of the project, the Sri Lankan government has surveyed all of the country�s 37,050 acres of mangrove forests-identifying previously unknown areas-and introduced legislation to protect them. Sudeesa nurseries have grown more than a quarter of a million mangrove seedlings, and 50,000 have been planted with the help of the Sri Lankan Navy, schoolchildren, and community members. More than 1,000 acres of forests will be replanted in 2016, and another 8,600 acres over the project�s lifetime. According to Seacology, Sudeesa is providing job training and microloans, financed by Seacology, to women and youth in coastal communities. This lets poor families earn a sustainable living without cutting mangroves. So far, 438 community organizations have been set up, 575 women and 348 youths have completed training programs, and 381 women have received microloans. In return, each community has agreed to help protect 21 acres of mangrove forests. Over the next four years, Sudeesa will train another 6,925 women and 7,152 youths, and offer 14,619 more microloans to meet the target of providing job training and microloans to 15,000 women and youths in 1,500 communities. "By offering training and funding to develop alternatives to cutting mangroves, the project is alleviating poverty as well as protecting mangroves. It�s a win-win situation," Seacology Executive Director Duane Silverstein said. 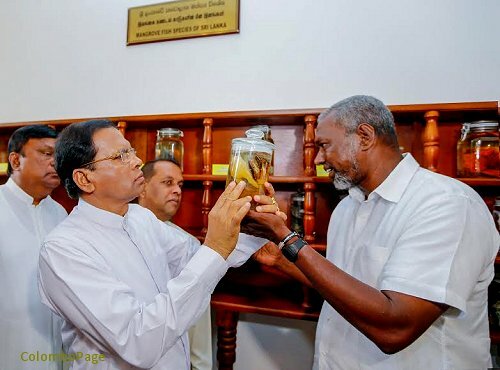 Minister of Fisheries and Aquatic Resources Development Mahinda Amaraweera, Chief Minister of Wayamba Province Dharmasiri Dasanayaka, Directors of Seacology and, Secretary General, Sri Lanka National Commission for UNESCO Dhammika Wijayasinghe also participated in the occasion.